Video conferencing provides many significant benefits to businesses of all sizes, and it’s becoming a must-have tool for most. If you haven’t invested in video conferencing yet, you should at least be aware of what you are missing and what options are available to you. If you are already using video conferencing, now is a good time to reflect on whether it’s time for an upgrade. 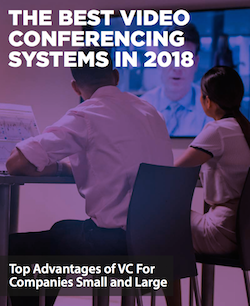 To learn more about the benefits of video conferencing - as well as the best solutions for the upcoming year - read our guide on The Best Video Conferencing Systems for 2018.